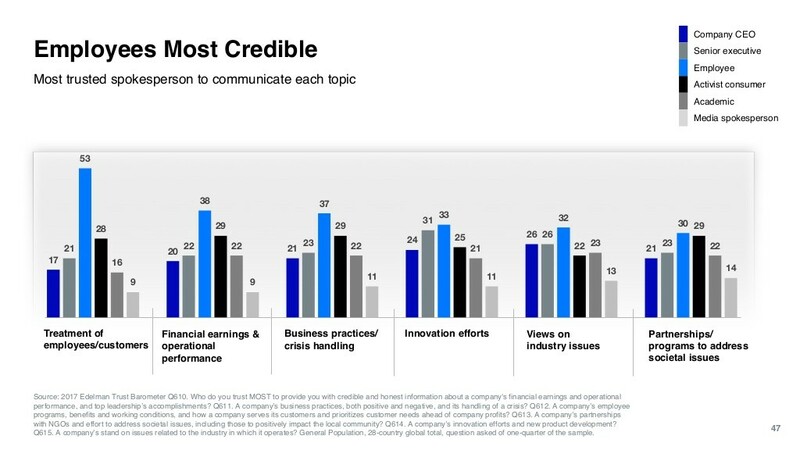 Every year, global PR agency Edelman unveils its “Trust Barometer,” which aims to educate media, businesses and government on the status of public trust. Given that 2016 was largely considered the year of “post-truth,” it’s unlikely that many will be surprised at this year’s results. Looking through a Canadian lens, here are a few insights that we found particularly jarring but worth knowing as communicators put their yearly plans into place. The report found that less than half of Canadians now trust their institutions (49%), which sits in line with the rest of the world (47%). For reference, Edelman classifies institution as government, business, media and non-government-organizations (NGOs). Given that 2 in 3 countries are now considered “distrusters,” PR professionals within a multinational corporation must take these stark differences into account. A prominent theme within last year’s World PR Forum, Elite Communicator’s Christie Smith shared her key strategies for engaging in effective cross-cultural communications. 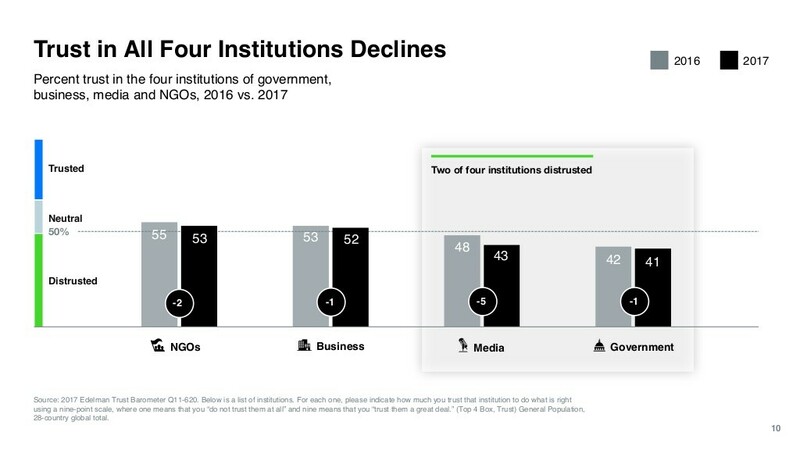 While trust has declined amongst all four measured types of institutions, media saw the largest decline and government remains the most mistrusted. This is especially startling, given the media’s role of keeping government’s accountable to the general public. It’s no doubt that fake news has had a significant impact on this. In December, an Ipsos survey commissioned by BuzzFeed found that fake news headlines fooled American adults about 75% of the time. We wonder if Canadians would have fared better? But don’t let the numbers depress you – trust in earned media has not dried up completely. In fact, Edelman also found that 71% of consumers rely on third-party sources for buying decisions and that 80% of them will regularly use traditional media sources to find brand information. PR professionals should be working even harder to facilitate good media relationships. CNW detailed some valuable tips for communicators seeking to bolster their position with media. 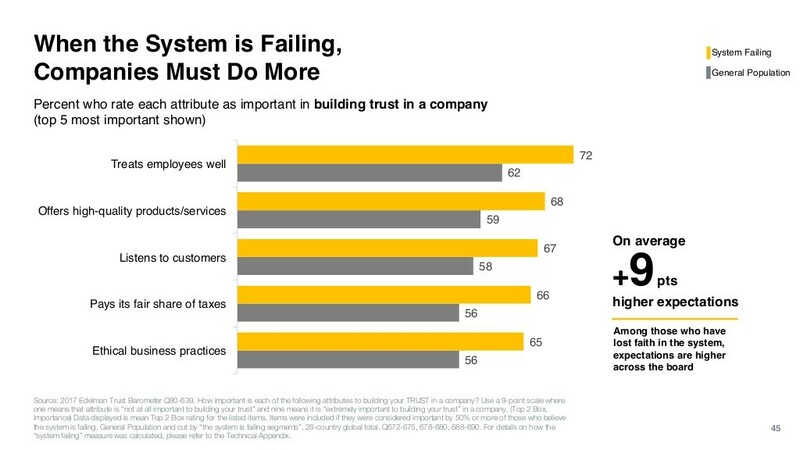 For organizations looking to build back public trust, they need to start internally. According to Edelman’s findings, almost two-thirds of respondents rated employee treatment as imperative to building (or re-building) credibility. This can be achieved through good internal communications within the organization – in case you need more proof that corporate communications is an essential function. A vast majority of respondents also want companies to listen more to their customers. Implementing a data-driven listening strategy will help your team uncover audience needs, enabling you to proactively create communications initiatives. Sometimes your CEO may not be the best spokesperson. This is especially the case when it comes to issues around employee/customer treatment and crisis handling; both are places where an effective communications team comes into play. 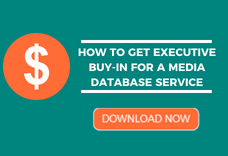 Here are some best practices for ensuring that your spokesperson is properly prepared. For decades, institutions held the highest form of influence and authority, doing things “for” people. 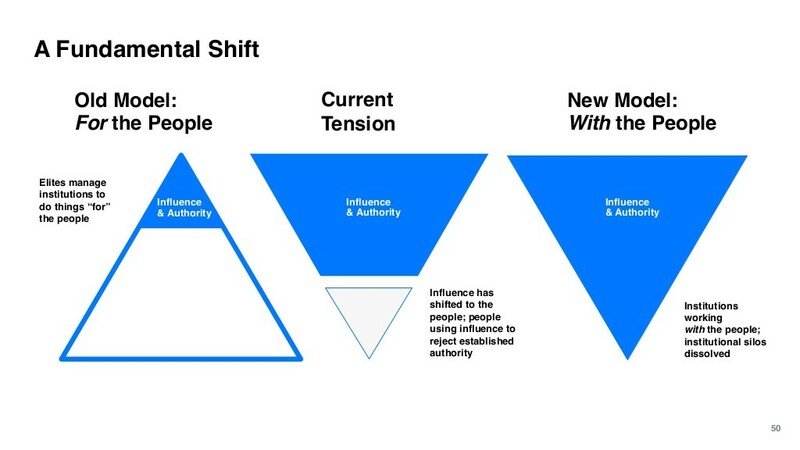 There’s no doubt that the power of influencer has shifted in favour of the public, who use influence to reject established authority. This is most evident in the rise of livestreaming, user-generated content, and influencer marketing. We are all capable of sharing news in real-time and organizations are expected more than ever before to work with the public in order to meet their needs. If you haven’t already, consider including those three strategies in your communications plan ASAP. What stats stuck out to you most? Tell us in the comments below, or tweet us @Cision_Canada.